Cherry Tea Cakes: I'm engaged! and other announcements! I'm engaged! and other announcements! Thursday my boyfriend says "Hey, let's go to the arboretum Saturday morning. We haven't gone in a long time." I think he's nuts because Saturday will be the hottest day of the year, record breaking heat, and for that matter, he's not a wake-up-early-on-a-Saturday-morning kinda guy. And I am really not a wake up early kinda girl. Friday night he says "Okays, is 9:20! Time for bed!" And I'm like "Who are you and what have you done with Brandon?" Four hours of a Man v. Food marathon later, he gets a phone call from a co-worker and says he needs to head to the office, and thus convinces me it's time to go to sleep, and he reminds me about the arboretum in the morning. I scrunch up my nose. And he says "It's water lily season! You love the waterlilies! They're night blooming so you have to go early." I begrudgingly agree, scrunched nose and all. Saturday morning he's making every attempt to coax me to get up. He reminds me of the waterlilies. I don't like them as much at 7 am. He bribes me with chocolate. Meh. Then he goes in for the kill: Cheese. I decide to get up for cheese. As we're driving to NE my foggy little brain is thinking "Why are we going to the arboretum to look at water lilies? Shouldn't we be going to the Kenilworth Aquatic Gardens?" But I'm tired and so I roll with it. We get there. I see the lilies next to the welcome center, look at little baby duckies and incredibly hungry koi fish and say, "aw, so cute honey. thanks for bringing me" and he says "oh, can we go over to the frog pond too?" So we walk the quarter mile to the azalea gardens where a sweet little pond full of frogs and water lilies is nestled. As we're walking along the trail I see tons and tons of these little frog gummy candies. I jokingly ask him if this is a Hanzel and Gretel situation, but when we get to the pond I see big bags of the candies with notes attached talking about how special that frog pond is to somebody and that they just wanted to share. I think, oh that is darling. So cute. It's so sweet somebody would do that. We sit on a bench and Brandon gives me my promised chocolates (a TCHO nutty 20, Voges bacon bar, Fleurir Northwest Bar, and a Kingsbury lavender pistachio) and three lovely strong cheeses hand wrapped from Cheestique and says "I also have a baby sloth for you"
I have a small baby sloth meltdown. It's a puppet baby sloth, a stuffed animal, but I just died that he'd even found one. Then he throws a frog stuffed animal at me. He pulled out a letter, beautifully written, incredibly sweet. Then asks if I want to go over and look at the water lilies. As I'm standing out on a little rock in the pond, he kneels down on the rock and says "Jana, will you..." and I interrupt him completely by saying "mmm hmmm! mmm hmmm! mmm hmmm!" and nodding my head vigorously. He finishes his sentence, and I regain my ability to speak, says yes, and we hug and kiss. Then he says, "Oh, can you look that way? Butchie is over there with a camera and she'd like to get to picture." And I am shocked. We have pictures of the whole thing! Then he says, " Oh, and Frank and Sue are just up there!" And I am shocked. Our best friends are both here! And he says, "Oh, and you should say hi." And I am shocked. I turn around and my friend Kim, who lives in NYC is standing right there! He imported Kim! and she brought Laduree macarons! 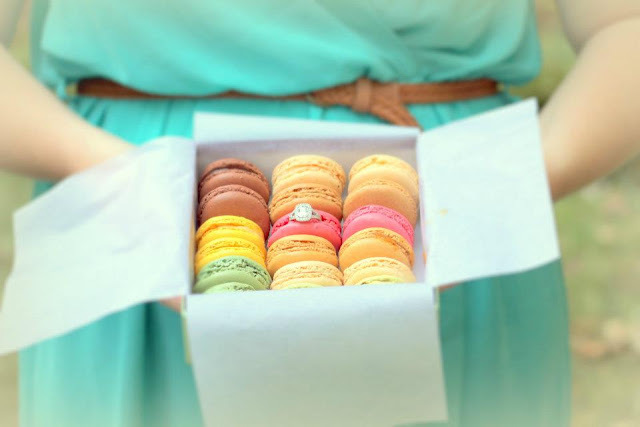 I have a fiancee, a beautiful ring, my best friends, a baby sloth and macarons! How can this get better? And Sue says "Let's go to brunch!" And I am shocked. When we get to Liberty Tavern 25 of our friends are there and we have an amazing brunch sharing all the good news with them. They aren't shocked. He asked them to go to brunch three weeks before! All my friends have known/suspected for three weeks! Not a one of them saying anything! And that co-worker phone call...yep. He left to pick up Kim at Union Station. He had our best friends hiding and snapping pictures from the bushes! Well played, Mr. Lee. Well played. You have one happy fiancee. Also, don't be surprised if you start seeing lots of cute wedding and bridal shower foods in my coming posts. :) he he he. I'm engaged! Yay!